We've spoken before about the ubiquitous nature and the homogeneity of sports movies. They come along on a fairly regular basis and, at their core, many of them are exactly alike. And while baseball movies seem to dominate the landscape, we have seen more and more football movies hitting the screens. And while some of these deal with professional football, few of them actually contains teams which are in the NFL. Movies like The Last Boy Scout and Any Given Sunday clearly deal with an NFL-like product, but we are presented with fictitious teams. The NFL must be loosening the reins on this policy. 2014's Draft Day featured real NFL teams, as does Concussion, but the latter does not portray the league in a good light. Nigerian-born Dr. Bennet Omalu (Will Smith) works in the coroner's office in Pittsburgh. He loves his work and revels in learning how a patient died. He is also does forensic work and helps convicted felons prove their innocence. In other words, Dr. Omalu searches for the truth. That is why when former NFL player Mike Webster (David Morse) is assigned to Omalu, he looks past the obvious heart attack and examines the patient's brain, using his own money to have very precise tests done. He discovers a unique form of brain damage in Webster. He presents his finding to his boss, Dr. Cyril Wecht (Albert Brooks), and then to noted scientist Dr. Steven DeKosky (Eddie Marsan), who helps Bennet get his findings published. The article clearly points to football as the cause of the problem. When another former player dies and shows the same issues, Omalu decides that he must confront the NFL with this, and he's aided by former team physician, Dr. Julian Bailes (Alec Baldwin). But, he will soon learn that the NFL has no interest in the truth. First of all, let's address the elephant in the room -- the actual NFL's actual participation in this film. We get actual NFL players, actual NFL teams, and Luke Wilson portraying NFL Commissioner Roger Goodell (that may not be that big of a deal, but it's always nice to see him getting work). As noted above, there have been other films which portrayed professional football which did not have the NFL's blessing. Was it because these movies portrayed controversial things like substance abuse and violence? (The flipside of that argument is that NFL properties were shown in Ace Ventura: Pet Detective. Why did that silly movie get the OK?) The point here is pretty clear -- if the NFL had not cooperated in the making of this film, it would have appeared as if they were ignoring and denying the existence and impact of CTE. The inclusion of NFL logos and actual players leads an air of credence of the film which may have been diminished if we'd gotten something like the Pittsburgh Riverdogs instead of the Steelers. The NFL may be included in Concussion, but a lot of other things are missing. Director Peter Landesman's background is in journalism and documentaries. Perhaps that explains why the movie is so cold. We are shown many unfortunate things -- players dying, Omalu's setbacks -- but the entire thing is simply emotionless. The film shows us these things, but it never invites us to be a part of them and it is never engaging. There is also a total lack of suspense and tension. Similar to the recent Spotlight, the story portrayed in Concussion has received a great deal of press. Perhaps this had an effect on the film's tone, as I felt that I knew a lot of what was going to happen. Still, the movie's pace is incredibly slow and even though the movie is telling us that Omalu is desperate to have his findings go public so that people will understand the dangers of playing football, we never feel that passion. The movie is also hampered by Will Smith's performance. Smith is meant to be playing a real-life person, but all that we can see if Smith. Smith is a naturally funny and charming guy, and that comes through here. Unfortunately, many of the scenes do not call for Omalu to be funny and charming. Smith's buoyant acting actually seems very off-kilter with the serious subject-matter of the film. Therefore in the scenes where he really tries to act and be forthright, it's difficult to take him seriously. I know that his wife was disappointed that he didn't get an Oscar nomination. There's a reason why. 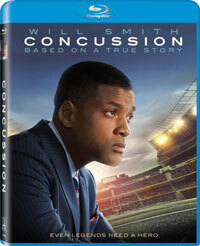 Concussion tackles (no pun intended) a very serious subject and it lays out all of the facts in a very concise manner. But, it does it in such a icy and off-putting way that it's difficult to get involved in the movie. We should be upset that these men are dying in such a tragic fashion, but this film doesn't take us there. This is a lethal misstep. Given the die-hard nature of football fans it's going to take a lot to convince them that there's something wrong with their favorite sport and this movie certainly is not going to change many minds. Concussion made me want an assistant with pigtails on Blu-ray Disc courtesy of Sony Pictures Home Entertainment. The film has been letterboxed at 2.35:1 and the Disc contains an AVC 1080p HD transfer which runs at an average of 25 Mbps. The image is very sharp and clear, showing no overt grain and no defects from the source materials. This is a somewhat dark film, but the Steelers' yellow is notably bright and cuts though the darkness -- given that, the image is never overly dark or bright. The image has a very nice amount of detail (and is never soft) and the depth is what we would expect from a modern film on Blu-ray. The Disc carries a DTS-HD Master Audio 5.1 track which runs at 48 kHz and an average of 2.4 Mbps. The track provides clear dialogue and sound effects. This is a somewhat quiet film, but we do get some mild effects here. There are no truly notable subwoofer effects, but there are some stereo and surround effects in exterior scenes. These aren't demo-level quality, but they add some presence to the scenes. The Concussion Blu-ray Disc contains a few extras. We begin with an AUDIO COMMENTARY from Director Peter Landesman. The Disc offers nine DELETED SCENES which run about 13 minutes. There are two scenes of note here -- one in which Bennet experiences racism and another where he begs someone to not play football. "Inside the True Story" (11 minutes) contains comments from the real Dr. Omalu, Dr. Bailes (that's good casting), Dr. Wecht, and Dr. Ronald Hamilton, all of whom recount how the basic part of the story came about, including details about the first autopsy and how things progressed from there. Jeanne Marie Laskas, who wrote the original article which serves as a basis for the film, appears in "Crafting Concussion" (13 minutes), along with other members of the creative team and the cast, who discuss the story and the making of the film. This includes some on-set footage.